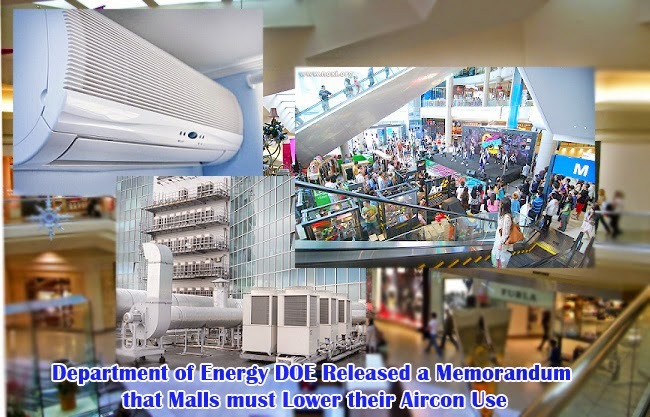 March 2015 had rolled in and this only shows that summer is right around the corner, making many people go to malls for the cool comfort, however, Department of Energy had released a memorandum that malls should lower down their electricity consumption and limit their airconditioning temperature to 25 ̊c. During the last week of February, the electricity spot market price spiked from P3.80 per kilowatthour to P6. This increase in the prices of the electricity spot market will be shouldered by the consumers this coming March. While the prices are getting higher, the demand will also surely go up as summer comes. Due to the issue of prices and the dwindling electricity reserves for Luzon this summer, DOE released a memorandum to their employees that air conditioning temp must be limited to 25 ̊c. They also allow their employees to wear ‘cool attire’ to give them comfort. Jericho Petilla, Energy Secretary, shared that if all will lower down their air conditioning in the suggested temperature, it could save an entire big plant of energy. He also shared that the DOE is being serious with their memo. SM Malls had pledge their support under the leadership of their president Annie Garcia. Ayala Malls also promised to help with the energy conservation initiatives, while Robinsons Malls management also shared their willingness to follow the memo but will also put the comfort of their customers into consideration. On February, the electricity usage had soar to 7,500 megawatts and is also expected to reach 9,000 megawatts during summer. Petilla further shared that if consumers will be serious in participating with the energy conservation, it will greatly ease the dwindling electricity reserve for Luzon during the summer.